Rebibbia is the last stop on the B line, far from the Center of Rome with it tourist buses and luxury hotels. It's also the home of the Rebibbia prison. If you walk along the gray stone walls, with their blue guard towers signs note Casa di Reclusione and Casa Ministero di Grazi et Giustizia. In the early evening sparrows fly over the prison and you can hear the honking of geese along with the ringing of nearby church bells. 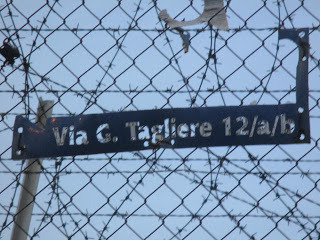 From l951-3 the great Italian director Pier Paolo Pasolini lived in the Rebbibia area on Via Giovanni Tagliere and as you walk along the Via Chiodi Virginia which runs along the side of the prison, a sign reading V. Giovanni Tagliere is mysteriously imbedded in the barbed wire and the air is rife with the contradiction between religion, Marxism and morality that would characterize Pasolini's work. For instance, the 311 bus which takes you from the Rebibbia train station to the prison has stops at Marx, Kant and Spinoza. Rebibbia was a likely influence on the scene in Mamma Roma (1962) when Roma's son Ettore dies on a gurney in a prison hospital. It's a scene framed after Mantegna's "Lamentation of Christ." Rebibbia is still a working class neighborhood today and it even has an Italian branch of Midas Muffler right outside the subway stop. But when you walk along the narrow streets with their modest two story houses that lead to one of Rome's major prisons you can view first hand the influences that went into the gestation of Pasolini's esthetic. Verlaine wrote these lines from a prison cell: "Le ciel set par-dessau le toit, Si blue si calme, un arbre par-dessus le toit, berce sa palme, la cloche, dans le ciel qu'on voit, Doucement tinte .." And here is a Pasolini's "Poet from ashes:"
a paupers' house, in the outer suburbs, near a prison. There was a foot of dust in the summer; in the winter, it was a swamp. my honest dreams of poetry."